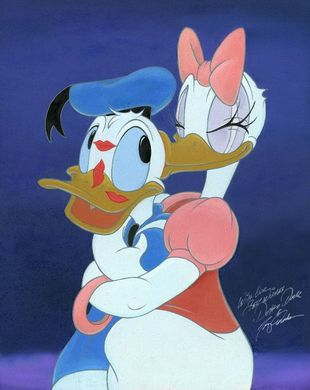 Tony Anselmo (Voice of Donald Duck) Limited Edition Canvas Giclee:"Kisses for Mr. Duck"
About the Artist: In 1990, when The Walt Disney Studios released The Prince and the Pauper, Tony became the first person to animate AND voice Donald Duck. He is a member of the Academy of Motion Picture Arts & Sciences, and serves on the Animation Executive Committee. In 2009, Tony became a recipient of The Walt Disney Company's Disney Legend Award.